Bern, the capital city of Europe’s most scenic country, Switzerland, looks as though it is peeled directly from the pages of a fairy-tale book. With the old city surrounded on three sides by the turquoise waters of the flowing river Aare, a sea of medieval buildings spanning the old town and the spire of the Bern cathedral piercing the blue sky, Bern is a sight not to be missed. Switzerland is renowned for being one of the most beautiful (and most expensive) countries in Europe. Bern is no exception – particularly when considering accommodation. If you have the money to spend, for around $600 a night you can book yourself into Bern’s best hotel: the Bellevue Palace. With five stars and set in the heart of the city, the Bellevue was built in 1865 as an upmarket hotel, and has remained that way. Luxe red velvet curtains, decorative cornices and bay windows are some of the features of this luxurious hotel, where even sleeping is an experience in itself. For a more affordable stay in Bern, consider the Hotel Jardin for $195 a night. Offered in this price is a comfortable queen bed, free tea and coffee in the concierge and free use of public transport throughout the city. With colourful rooms, all the modern amenities and great customer service, this is an excellent and less costly alternative to the Bellevue. The best experience to be had in Bern, if the weather permits, is to go floating down the crystal clear waters of the fast-flowing river Aare. Dissecting the city, a swim down the river not only offers Bern’s most unique experience, but also some of the best views. The water, flowing from the Upper Rhine, is essentially glacial water making its way down from the mountains, meaning the river is both fast and freezing (and remarkably refreshing). This activity is not for the faint-hearted, although reasonably safe, with exit points all along the river. It is advisable for non-so-confident swimmers to engage a flotation device like a ‘Wickelfisch’, which seconds as a bag to store your clothes and shoes. Legend has it that the city of Bern was actually named after a bear, the first animal that the Duke of Zähringen found on a hunt in the surrounding areas. Therefore, visiting the Bear Pit, stationed beside the River Aare, is a fitting thing to do while in town. The three bears – Finn, Björk and Ursina – can be watched from above, or below (through a glass divider), paddling in the fresh river or scaling the hill to find a good sunbaking spot. You can also enjoy a delicious dinner at Brasserie Bärengraben, situated above the bear park in a historic building. At this restaurant you can enjoy duck terrine with onion confit, foie gras with wine jam and marinated mussels. 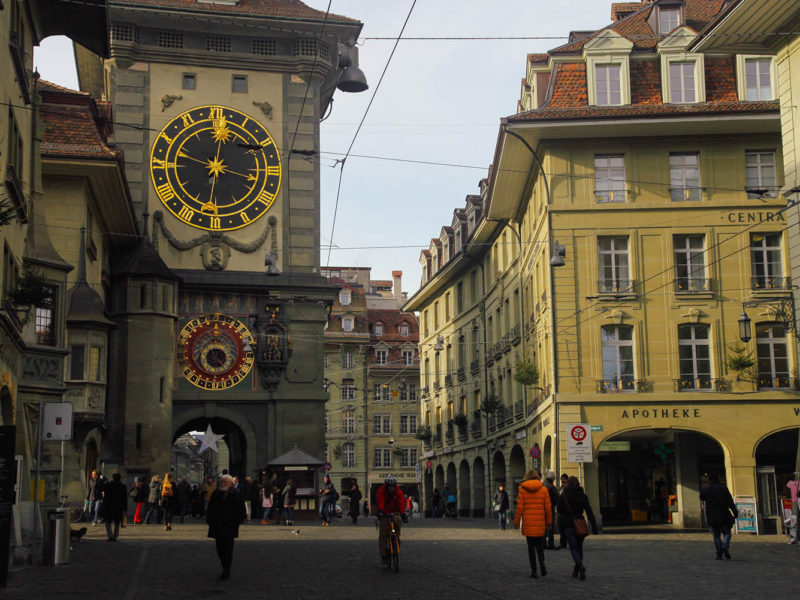 Only six kilomtres at its widest point, the Bern’s old town is perfect for exploring on foot. A UNESCO World-Heritage site, it’s renowned for its perfectly preserved medieval buildings and is home to the Bern cathedral and clock tower. These monuments, straight out of the storybooks of your childhood, should definitely be on your Bern itinerary. While in the old city, have a wander through the boutique shops and admire the sculptured fountains, framed by posies of red flowers against the carved stone. These fountains, found all through the Old Town, are the perfect place to wash your face and fill your water bottle, as the water is pumped straight from the glacial waters below. Swiss food, although somewhat pricey in Bern, is an important part of exploring the city. Swiss chocolate, the most famous chocolate in the world, is best eaten at Läderach. With three stores in the city, it offers chocolate slabs that come in an immense range of different concoctions. Try the hazelnut milk (we are talking whole hazelnuts), classic milk or caramel fudge. To supplement the above food group, head out and try a Swiss rösti. The rösti, essentially a big hash brown, is often accompanied by a range of hearty ingredients. The best rosti in Bern can be had at the famous Kornhauskeller, where they’re served with tomato, bacon, onion and cheese. Other delectable items on the menu here include boiled beef with smoked ham and bacon, thin-skinned beef carpaccio and grilled sea bass fillets with tomatoes, olive oil and thyme. Not only is the food brilliant, but the Kornhauskeller also boasts baroque architecture and is located in a vault in the centre of the old town. Other places to consider a night out are Krone restaurant for a delicious Mediterranean feed and Wash Bar (a trendy bar for ‘coffee, drinks and laundry’) where you can multitask your afternoon away, meeting some locals while you clean your clothes. Gurten, Bern’s resident mountain, has a lot to offer. Standing tall at 860 metres above sea level, you can scale it by train or foot for a fantastic view over the city and three lakes region. Add toboggan runs for all seasons into the mix – one of Bern’s most loved and cheap-as-chips activities – and you’ll find a day on Gurten is a day well spent.